Taking care of yourself, a hard concept to grasp if you anything like me you have difficulty with it especially when your stress level is high and you can't think of anything else but how to solve the problem. I am sure you have heard it over an over again "take care of you so that you can better take care of your baby/child" and I have even talked about it in a few posts. Let's face it between the doctors visits, the coordinating appropriate services/therapies, and of course caring for your child, taking care of your home and rest of your family members...What times is there for you? Recently I began symptoms which I associated with many years of stress (or maybe its age, but, I will go with stress)... When things got back to somewhat "normal" routine, I was able to reflect on what what going on. I was experiencing anxiety in the most unusual way and it was crippling. Where was it coming from?? Then it hit me I needed to do a better job at taking care of me. Was it finally my turn? (15 years later..). Can't say I am great at this. It isf an adjustment. Clean diet was the first on my radar, no more sugar, my morning start with Lemon & Water (a little honey) then maybe a tea... Mamavation has a great website/blog on where to start without getting overwhelmed. I've been following her suggestions and while I am no where close to perfect it hasit has helped me a lot. I also cleaned out cabinets from toxic products I cleaned with and I was introduced Purehaven Essentials, harmful Chemical Free products that actually work better then any harmful chemical items I had been using. I have also adapted some Ayurvedic techniques into my daily routine. (Ayurvedic Medicine is it is a Hindu system of medicine, baed on balance of body, diet, herbal treatment and breathing). Working on exploring a Gluten free diet. I recently got into HOT yoga, something that I had avoided like the plague for years. I now notice a difference when I miss classes. I am still trying to figure out what this "me: thing is all about. Definitely a foreign concept for me...something I lost when I had a preemie. If anyone is lost and need more direction. Try getting a health coach. Check out my friend Sue's (also a special needs mom) website .. her coaching gears toward us "special" mom's/dad's etc... So you will be talking to someone who truly lives it. Her website is Go with the Flow Wellness her loge "caregivers need care to". Schedule your free Personal Wellness session today and check our her Facebook page as well. For even more tips to take care of your self check out this blog post. from another mom. It was a pleasure to try and review this product for CozyPhones such a great idea especially for those have sensory issues. Earbuds can be uncomfortable and head phones are too heavy on the head. For us it was the first time my son would leave a headphone on for a period of time and bonus I didn't have to hear the repetitive music (or shows) he likes to play on his ipad. When trying to talk he wouldn't have to scream to get my attention (extra bonus). He also had a fun time with the fun panda design. If you have an older child check out Cozyphones website at www.cozyphones.com they have other designs. disclosure; CozyPhones contacted me to try out their product. All opinions are my own. Once and a while a company will reach out to me to try their product. 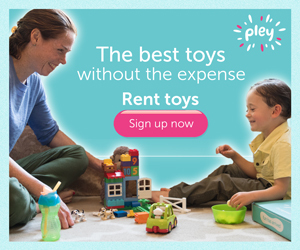 Recently it was a rent a toy company called Pley. Pley will also take toys and send you a pre-paid shipping label. For example; they accept LEGO's mixed bricks, complete toys or even that half missing LEGO set you trip over often, you know those toys, I have quite a few myself. So check it out!! What a great concept. I highly suggest checking it out.. Thank you Pley for creating such a great idea..
disclosure; Pley.com contacted me to try out their subscription. All opinions are my own. Autism is a lifelong developmental disability that affects nearly one percent of the world’s population. Since it is a spectrum condition, all people diagnosed with the disability will need not necessarily face the same difficulties. While some people diagnosed with the disorder may face severe intellectual challenges, others show above average ability and are able to live relatively independent lives. According to the Center for Disease Control and Prevention in the United States, there has been a 30 percent increase in the prevalence of autism in children aged 8 from 2012 to 2014. The below infographic will help you understand the worldwide scale of autism and the average costs of services for treating autism. Our son has been on growth hormones (GH) since around the age of 10 and we have recently hit the end of our Growth Hormone Journey. Thinking back and after talking to several moms who's child has been on GH, I feel like we had a weird experience. When we first started at age 10 our son's bone age around 3 years delayed. Our son had a very good response in beginning of this journey. His doctors were thrilled...when he started hitting puberty (11-12 to me this seemed too early, but I was assured it was not) ..
We had his bone age done yearly. About a year into the treatment his bone age seemed to be catching up. By age 11 he was one year ahead peers! Meaning he went from a 3 years delayed to one year advanced! These were our options we discussed with the doctors. 1. Keep the current status quo on growth hormones until hes done growing and let things progress as they would. 2. introduce an aromatase inhibitor (i.e. letrozole or anastrozole) that would prevent the conversion of testosterone to estrogen (estrogen is the hormone thought to be responsible for fusing the growth plates) thereby allowing the bone age to stay "frozen" at 15, and giving him more time to grow". Now, keep in mind Aromatase inhibition is NOT standard of care, it is used breast cancer patients and has NOT been approved by the FDA. It is recommended to only be used in research settings. There have been only few studies using it for growth purposes with limited success, but again, in very few studies. Risks? Aromatase inhibition will raise the Testosterone levels...and may be associated with some increased acne, blood counts, liver enzyme elevation, cholesterol, and potentially aggression. Many doctors have had mixed results. I was told that all the boys on it got significantly worse acne and a deeper voice. Of course just like everything else in our journey doctors had not ever used this it in a patient with Autism and baseline behavioral difficulties.. This was all, last year, so...fast forward now age 13.5, our sons bone age advanced even further to age 16.5!! We also have a followup with Genetics. The testing we did at the beginning of our journey is being re-evaluated because i'm told 4 years in Genetics is light years. That's another post for another time when I get results. (***results of gentics below). So... there you have it, our personal experience with Growth Hormones...would love to hear any feedback or stories anyone else out there may have..
***4/16 update: Genetics testing showed that my son had a partial extra chromosone 17 so they tested me and my husband. I also have it. They don't quite know what that is they have never seen it (of course) but since I tested positive for it (and I'm ok) I am told its nothing to worry about.